It’s a hard life being a parrot. You have to stand up all day on your perch without falling off. 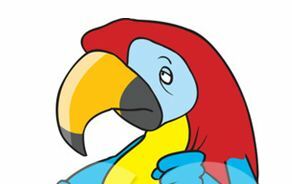 Here’s a bigger Parrot document which is a picture of me. Cut me out without the branch I’m standing on and stick me on to a piece of thick cardboard which won’t bend. If you weight my tail, it will lower my centre of gravity so I can perch on your finger. Sweet. A commendation is available for 80% or better.